Smyth was born May 1, 1898, in Clinton, New York, to Ruth Anne Phelps and Charles Henry Smyth, Jr., a professor of geology at Hamilton College. 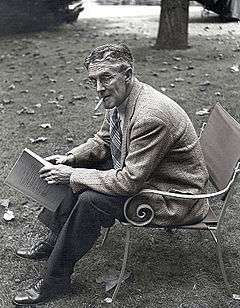 Woodrow Wilson, then President of Princeton University, convinced Smyth pére to join the faculty at Princeton, and in 1905 the family moved to Princeton, New Jersey. 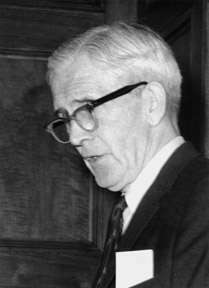 In the mid-1930s, Smyth began to shift his interest to nuclear physics, inspired by James Chadwick's discovery of the neutron, John Cockcroft and Ernest Walton splitting the atom, and Ernest Lawrence's invention of the cyclotron. Three of his last research articles concerned detection of triatomic hydrogen and helium-3. His appointment as department chair forced him to devote more time to administrative work, at the expense of research. As department chair, he had two cyclotrons built at Princeton, one in 1935 and the other in 1946. Fronticepiece of the Smyth Report. 1 2 3 4 5 6 7 8 9 10 11 12 13 Dicke, Fitch & Sherr. 1 2 3 Hunt, Morton M. (1949-11-12). "Mr. Atom". The Spokesman-Review. 1 2 3 4 5 6 7 8 9 10 11 12 13 14 15 16 17 18 19 20 21 22 23 24 25 American Philosophical Society biography. 1 2 Kauzmann, Walter; Roberts, John D. (2010). Charles Phelps Smyth, 1895–1990 (PDF). National Academy of Sciences. Retrieved October 26, 2011. 1 2 Bird & Sherman, pp. 544–6. ↑ "About Princeton Day School: History". Princeton Day School. Archived from the original on September 28, 2011. Retrieved October 26, 2011. ↑ Van Atta, Burr (1986-09-12). "Henry Dewolf Smyth, 88, physicist". The Philadelphia Inquirer. Retrieved October 26, 2011. 1 2 Shenstone, Allen Goodrich (Autumn 1982). "Princeton 1910–1914" (PDF). Princeton University Library Chronicle. 44 (1): 25–41. Retrieved November 20, 2011. ↑ "The alumni: '18". Princeton Alumni Weekly: 405. 1922-02-15. Retrieved December 6, 2011. This morning I had an abusive card from Harry Smyth, who is spending a year at Cambridge, Caius College, as a National Research Fellow in Physics. ↑ "Pyotr Leonidovich Kapitsa". Encyclopaedia Britannica. Retrieved 2014-01-19. 1 2 3 4 5 6 Schwartz. ↑ Morse, Philip McCord (1977). In at the Beginnings: A Physicist's Life. MIT Press. p. 58. Retrieved December 6, 2011. ↑ John Simon Guggenheim Memorial Foundation. "Henry DeWolf Smyth". Retrieved 2014-09-21. ↑ Smyth, H. D. "The radiating potentials of nitrogen". Physical Review. 14 (5): 409–26. Bibcode:1919PhRv...14..409S. doi:10.1103/physrev.14.409. Retrieved November 20, 2011. ↑ Smyth, H. D. (1922). "A new method for studying ionising potentials" (PDF). Proceedings of the Royal Society A. 102: 283–93. Bibcode:1922RSPSA.102..283S. doi:10.1098/rspa.1922.0086. Retrieved November 20, 2011. ↑ Smyth, H. D. (1923). "The ionisation of nitrogen by electron impact" (PDF). Proceedings of the Royal Society A. 104: 121–34. Bibcode:1923RSPSA.104..121S. doi:10.1098/rspa.1923.0098. Retrieved November 20, 2011. ↑ Smyth, H. D. (1925). "Primary and secondary products of ionization in hydrogen". Physical Review. 25: 452–68. Bibcode:1925PhRv...25..452S. doi:10.1103/physrev.25.452. ↑ Smyth, H. D.; Stueckelberg, E. C. G. (1930). "The ionization of carbon dioxide by electron impact". Physical Review. 36: 472–77. Bibcode:1930PhRv...36..472S. doi:10.1103/PhysRev.36.472. ↑ Stueckelberg, E. C. G.; Smyth, H. D. (1930). "The ionization of nitrous oxide and nitrogen dioxide by electron impact". Physical Review. 36: 478–81. Bibcode:1930PhRv...36..478S. doi:10.1103/PhysRev.36.478. ↑ Smyth, H. D.; Mueller, D. W. (1933). "The ionization of water vapor by electron impact". Physical Review. 43: 116–20. Bibcode:1933PhRv...43..116S. doi:10.1103/PhysRev.43.116. ↑ Smyth, H. D.; Mueller, D. W. (1933). "The ionization of sulfur dioxide by electron impact". Physical Review. 43: 121–22. Bibcode:1933PhRv...43..121S. doi:10.1103/PhysRev.43.121. ↑ Smyth, H. D. (1934). "Ionization of carbon disulfide by electron impact". Physical Review. 46: 276–77. Bibcode:1934PhRv...46..276S. doi:10.1103/PhysRev.46.276. ↑ "Frist Campus Center timeline". Princeton University. Retrieved October 26, 2011. ↑ Smith, Datus C. (Spring 1976). "The publishing history of the 'Smyth Report'" (PDF). The Princeton University Library Chronicle. 37 (3): 191–200. Retrieved October 27, 2011. ↑ Smyth, Henry DeWolf (Spring 1976). "The 'Smyth Report'" (PDF). The Princeton University Library Chronicle. 37 (3): 173–89. Retrieved October 27, 2011. ↑ Smyth, Henry DeWolf (1945). 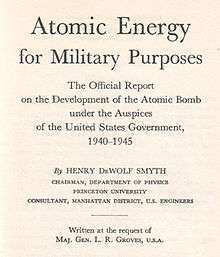 Atomic energy for military purposes; the official report on the development of the atomic bomb under the auspices of the United States Government, 1940–1945. ↑ Gordin, Michael D. (2010). Red Cloud at Dawn: Truman, Stalin, and the End of the Atomic Monopoly. Picador. p. 210. ↑ Wheeler, John Archibald (2000). Geons, Black Holes, and Quantum Foam: A Life in Physics. W. W. Norton & Co. pp. 188–9. 1 2 "Atoms for Peace Awards" (PDF). IAEA Bulletin. 10 (5): 10–11. 1968. Retrieved October 29, 2011. ↑ Fischer, David (1997). 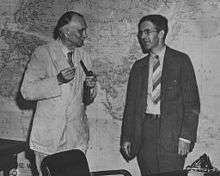 History of the International Atomic Energy Agency: The First Forty Years (PDF). IAEA. p. 1. Retrieved October 29, 2011. ↑ "IAEA timeline". BBC News. August 9, 2011. Retrieved October 29, 2011. ↑ Nuclear Regulatory Legislation. Government Printing Office. 2008. p. 271. Retrieved October 28, 2011. ↑ Quoted in Bird & Sherwin, p. 5. ↑ "The Goheen years". The Daily Princetonian. 2008-04-01. Archived from the original on 2012-06-14. Retrieved October 29, 2011. ↑ "Representative of the U.S.A. to the International Atomic Energy Agency (Vienna)". U.S. State Department Office of the Historian. Retrieved October 26, 2011. ↑ Quoted in the American Philosophical Society biography. ↑ "Henry DeWolf Smyth". U.S. State Department Office of the Historian. Retrieved October 26, 2011. ↑ Ramsey, Norman F. "The early history of URA and Fermilab". Fermilab. Retrieved October 29, 2011. ↑ "Henry DeWolf Smyth Nuclear Statesman Award". American Nuclear Society. Retrieved October 29, 2011. ↑ "Recipients: Henry DeWolf Smyth Nuclear Statesman Award". American Nuclear Society. Retrieved October 29, 2011. ↑ McQuiston, John T. (1986-09-14). "Dr. Henry Smyth, ex-member of atom panel". The New York Times. Retrieved 2014-02-10. ↑ "Henry Smyth; wrote report on 1st A-bomb". Los Angeles Times. Times Wire Services. 1986-09-18. Retrieved October 29, 2011. ↑ "A family (faculty) chair". Princeton University. January 2010. Retrieved October 29, 2011. ↑ "Princeton News". Princeton University. Retrieved 2014-12-11. "Henry DeWolf Smyth papers, 1885–1987". American Philosophical Society. Retrieved October 26, 2011. Schwartz, Rebecca Press (Sep 2008). 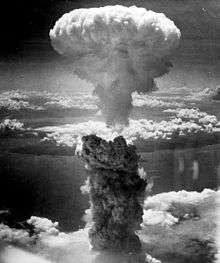 The making of the history of the atomic bomb: Henry DeWolf Smyth and the historiography of the Manhattan Project (Ph.D. thesis). Princeton University. OCLC 658981948.